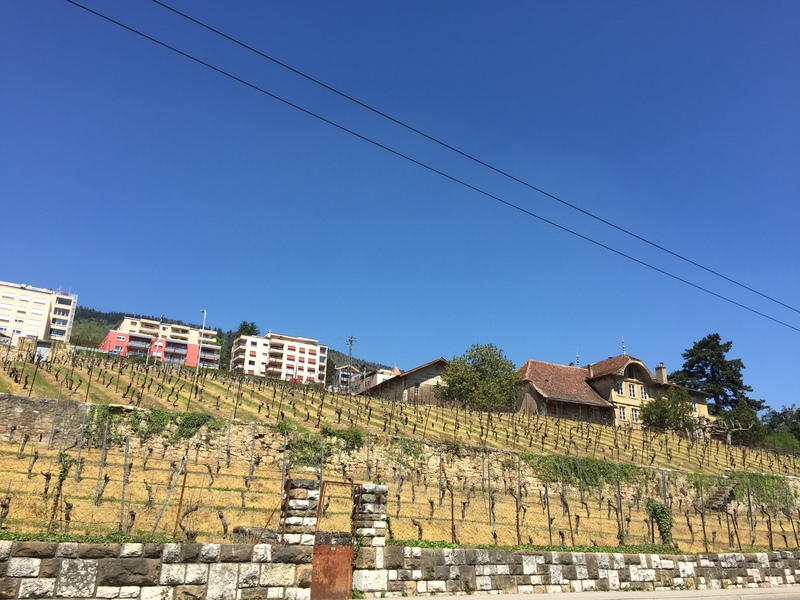 After our last experience with the French motorways and their exorbitant tolls we decided that our drive from Beaune to Zurich should primarily consist of back roads through villages and towns. We set out around 09:00. It was fascinating to watch the architecture change as the geography changed around us. 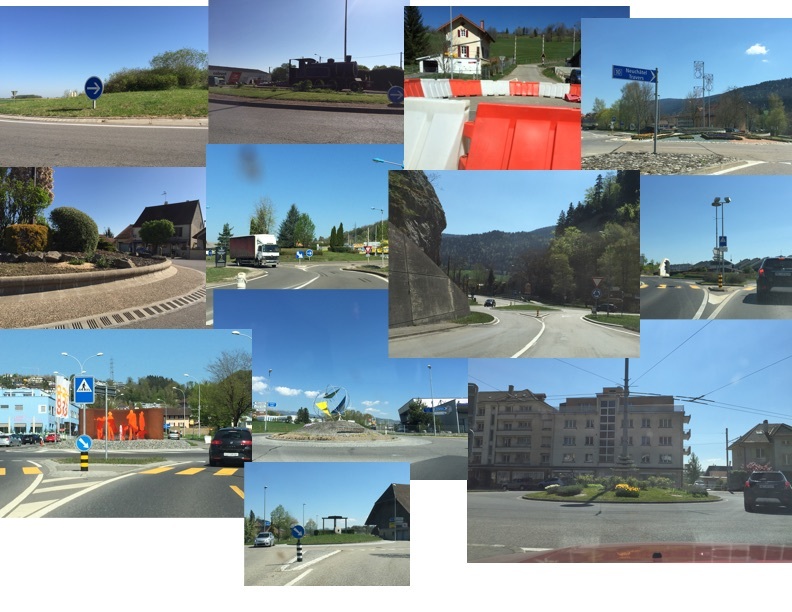 I told Liesel we should take a photo of every round-a-bout we passed on our trip but I’m sure my phone would have run out of storage space had she actually carried out my wishes. I wasn’t lucky enough to collect another stamp on my passport as we drove across the French/Swiss border. They waved the Irish plates through before I could even pull to a complete stop. It’s a drastic change within a few feet of entering the country. The roads are flawless and signage brighter and clearer. The winding roads sometimes seem to meander just for the sake of elongating the drive with no apparent obstacle making the increased infrastructure costs necessary. The first Lamborghini we pass and I realize just how out of place Liesel’s little Toyota is in this most blessed of countries. In addition to choosing a route that avoided the tolls we also asked our GPS to take us through Neuchatel, a beautiful lakeside town. When we crest the hill overlooking the town it reminds me of arriving home as the lake unfolds below us. The city itself is a busy place with many pedestrians filling the streets. Driving downtown is my first real test behind the wheel as up until now I’ve spend most of my time on open countryside roads and tiny village alleys. I barely manage to avoid any Swiss casualties on the multitude of crosswalks. A friend of mine, originally from Switzerland, often has told me of the overpopulation of his homeland and it’s easy to see his point. Aside from a few brief sections of road winding through preserved wooded areas it is impossible to look around and not see at least 3 communities around us. It feels like a video game world I used to play in where each town in the game is only a minutes’ walk from the next. The small expanses between these towns consist of perfectly formed fields sometimes occupied by cows and goats with tinkling bells around their necks. The road to Zurich passes Adliswil where Liesel spent a year of her life. She points out the train station and shops she used to visit. We arrive at our destination with a half hour to spare before our scheduled dinner, just enough time to settle in a bit before we walk over to the Schlossgarten. The blue skies make it a beautiful evening to sit out on a patio eating overpriced pizza. 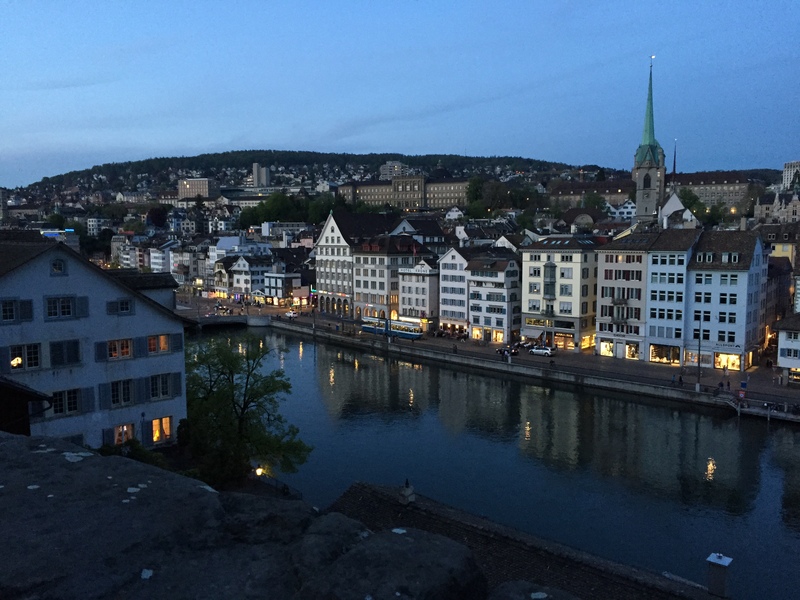 We end dinner, grab a jacket as the evening is starting to cool, and catch the bus into old town Zurich. It’s a busy Friday evening and it feels like the whole city has converged on the waterfront. It’s at this point I start to feel overwhelmingly homesick. It’s been over a week since I left home and only once have I been apart from Leanne for longer, when she made the trip to Spain a couple years ago. I wish she was here with me to experience the sun setting beyond the lake. Every restaurant is spilling into the streets with people winding down after another week. The shops are closed but plenty of folks are still looking through the windows, planning or dreaming what they may spend their francs on in the morning. As beautiful and bustling as the city is, I can’t help but feel an emptiness around me. Perhaps it’s the sneakers priced at 4 times the amount back in Dublin or maybe it’s the groups of young men dressed in the finest Italian clothing cruising the streets looking for temporary urban thrills. Or maybe it’s just my loneliness this evening in the midst of the partying elite. There’s not much I love more than exploring a new city but right now I’d trade it for just being back home. Liesel takes me to a spot high above the river and it’s clearly one of the best views of any city I’ve been in. I do want to see more of this and hopefully tomorrow when we venture back this direction I will be ready to just enjoy the adventure. 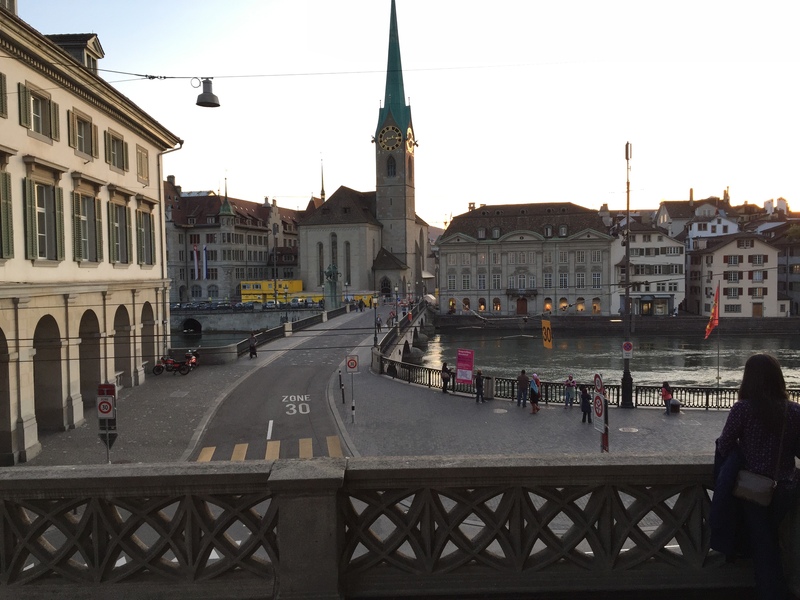 This entry was posted in BRING A PASSPORT and tagged Road Trip, Switzerland, travel, Zurich. Bookmark the permalink. Wow! I love those pictures! Did you take them or Liesel take them? I took most of these pictures except Liesel took most of the round-a-bout photos and the other one when I was driving through the town with people crossing the road.